This cake has become a favorite this season, after Henry, my son, grew his first zucchini (in our neighbor’s garden, I should add. Our patch did not do so well). He wanted to eat the zucchini, but frankly hates the vegetable, so I made this for him instead. He loved the cake, but suggested we just call it “Chocolate Cake,” because calling it “Zucchini Chocolate Cake” freaks him out. 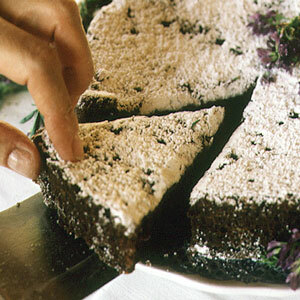 This recipe comes from May 2004 Saveur. It’s not a difficult recipe, even though the first step is a bit unusual (but makes for a great cake), just make sure to allow for quite a long baking time. 1. Working in batches, put a small mound of zucchini in center of large square of double-layer cheesecloth. Gather corners together and squeeze out as much water as possible. Transfer zucchini to a bowl and set aside. 2. Preheat oven to 325º. Butter a deep 9″ cake pan with 1 tbsp. of the butter. Sift flour, cocoa, baking soda, and salt together into a mixing bowl and set aside. Beat together remaining 8 tbsp. butter and sugar in a large bowl with an electric mixer on medium speed until fluffy, 3-4 minutes. 3. Add oil, beating well. Beat in one egg at a time, add vanilla, reduce speed to low, and beat in flour mixture and buttermilk in 3 alternate batches. Stir in reserved zucchini. 4. Pour batter into prepared pan and bake until toothpick inserted in center comes out clean, about 1 hour and 20 minutes. Remove from oven and set aside to let cool. Invert onto a plate and dust with sugar.